“Soundin’ Canaan: Creative and Scholarly Approaches to African Canadian Literature.” Black Canadian Studies Association Conference, Brock University. St. Catharines, On. May 24-26th. “Repetition with Difference: Schizophono poetics in Wayde Compton’s Performance Bond.” University of Toronto, Dep’t of English. Toronto, On. May 9th – 10th. “‘[H]istory will enter here’: Jazz Historiography in Dionne Brand’s Ossuaries.” Northeast Modern Language Association (NeMLA). Tufts University, Boston, U.S.A. NeMLA 2013. March 21-24th. “Listening on Lower Frequencies: Ellison, Coleman, Ra, and l’écouteur engage.” Accompanied by David Lee on bass. Guelph Jazz Festival Colloquium: Pedagogy & Praxis: Improvisation as Social Justice. Macdonald Stewart Art Centre. Guelph. September 5-7th. “Getting into the ‘Grooves of History’: Armstrong, Ellison, Coleman, and the ‘Authentic’ Jazz Listener.” Leeds International Jazz Education Conference 2012: Jazz Practice in the 21st Century. Leeds College of Music. Leeds, U.K. March 29-30th. “Spatial Stories, Sampled Memories, and Intermedial Improvisations.” Co-presented with Nick Loess (videographer). Guelph Jazz Festival Colloquium. Conference (Sound Practices), University of Guelph. September 8th. “Poieîn: Forming, Performing and Sampling Pedagogies in the Classroom.” Transmissions 2011: The Politics and Poetics of Humanities Research Colloquium. University of Guelph, ON. March 17th. “The Jazz Sample: Flow, Rupture, and Layering in Hip Hop.” Guelph Jazz Festival Colloquium. Conference (Improvising Bodies), University of Guelph. September 10th. “A Disruptive Poetics: Improvised Dissonance in Thelonious Monk and Wu-Tang Clan’s 36 Chambers.” Accompanied by Sean Fyfe on Piano. 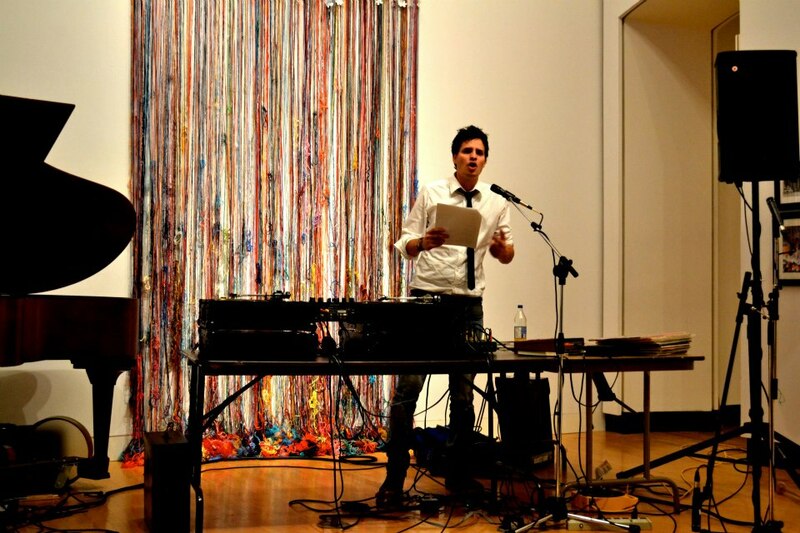 Sound Lines: Improvisation, Text and Media. Conference, University of British Columbia. June 25th. “The Ecolinguistics of Space: Responding Aurally to the Oral West Coast.” Literatures of the West Coast. Conference, University of Victoria, British Columbia. October 8th. Performer. Preludes & Passages: English and Creative Writing at VIU. Arts & Humanities. Live Radio Interview, “Scholarship on African Canadian History.” CFRU (93.3 fm). From the Second Story. March 10th. Invited Speaker, “Book, Performance, and Theatre Reviews.” Presented with Ann Wilson and Stephen Henighan. English Department (SETS). Graduate Professionalization Seminar Series. Guelph, ON. Dec 5th. Reading/Performance. Participated in a book-length reading of Zong! with M. NourbeSe Philip and others. B current, Studio 251. Toronto, On. Nov. 29th. Selected performative readings (with music) from Michael Ondaatje’s The Collected Works of Billy the Kid. Participated in a public book-length reading of Billy the Kid. TransCanada Institute. Guelph, ON. Thursday, February 28th. “The Critic as Poet & Citizen—or—The Poet as Citizen & Critic: Creative Life & Interdisciplinary Praxis.” Public Presentation. Guelph Public Library. ICASP Reading Group Speaker Series. Guelph, ON. November 25th, 2012. “Dedications.” Public DJ Performance. Silence concert series. Macdonald Stewart Art Centre. Guelph. Thursday, October 25th. “There is no such thing as music.” ICASP Tri-University Online Colloquium: Improvisation in the Universities. McGill University, University of Guelph, and University of British Columbia. In conversation with Fred Frith. Thursday, May 3rd. “‘Your bass sounds like a typewriter’: A Reading and Interview with George Elliott Clarke.” Co-interviewed with Katherine McLeod. Public Interview. TransCanada Institute. Guelph, ON. Friday, April 27th. “Writing is DJing/ DJing is Writing: A Multimedia Turntable Presentation.” Co-performed with Mark Katz (University of North Carolina), Mark Campbell, and Mark Onderwater. The 6th Annual Creative Music Festival and Colloquium, School of Fine Art and Music,University of Guelph, March 7th. Speaker, Plenary, “WRITING JAZZ,” A discussion between Paul Watkins and Cecil Foster (Sociology and Anthropology, University of Guelph). Guelph Jazz Festival Colloquium. Conference (Sound Practices), University of Guelph. September 7th. “Within and Beyond: Performative and Improvised Pedagogies.” Contributions: Improvisation in Artistic and Pedagogical Practices. Colloquium. Guelph Public Downtown Library. Guelph, ON. April 15th. “Listening to a Listening: Performing the Disruptive Jazz Poetics of Dionne Brand’s Ossuaries.” Public Performance. Guelph Public Downtown Library. Guelph, ON. January 28th. “A Polyphonic Branding.” Performative Reading. Avantgarden Poetry Series. The Ossington. Toronto, ON. November 15th. “Red Skin, White Masks.” Canadian Literature Colloquium. University of British Columbia. December.